How was your weekend? Mine was amazing! On Friday night K and I had dinner with my brother and his girlfriend at Devil's Acre, the food and drinks were incredible. They are known for their homemade sausages and brats which K said ruined sausages and brats for him for good because they were so tasty and meaty, not fatty. Then on Saturday afternoon my brother and his girlfriend got engaged. Yes!!! My baby brother is engaged and I could not be happier for them both. I think that finding someone you want to spend the rest of your life with is such an important and huge step in life, basically the most important decision of your life. Sometimes when I think of my brother I still imagine him as a little chubby toddler, he was the cutest little guy, but now he is a man and getting married soon... it makes me soo happy it's hard to explain. On Friday night when K and I met up with my brother and his fiancé I wore this outfit. I bought this blazer-looking long jacket a week or two ago and having been wearing it non stop ever since. It's comfy and makes any outfit look put together, almost suit-like. And it has pockets! I love outwear with pockets because I am constantly sans handbag or purse. 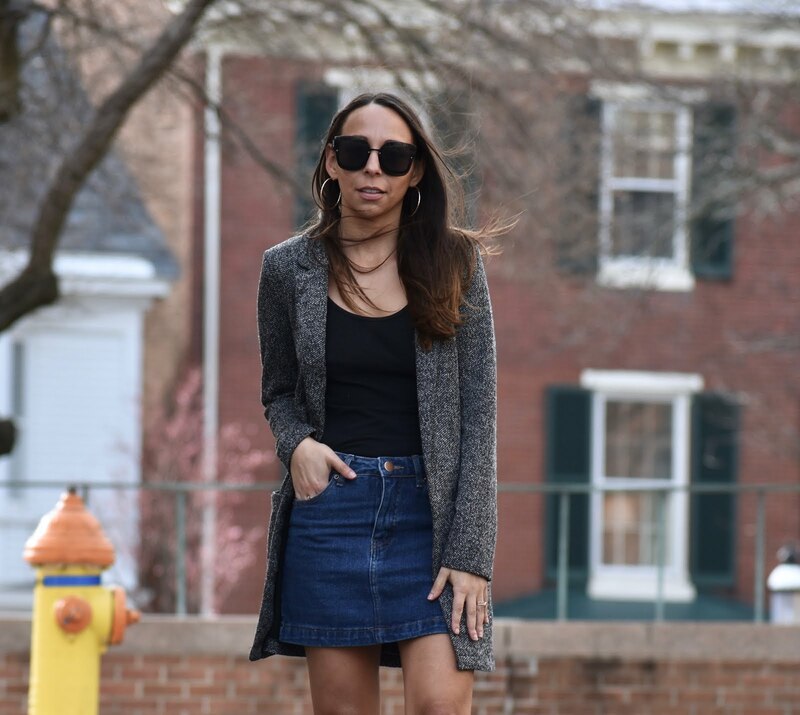 I paired the blazer with a little jean skirt another new buy that I think will become a staple I reach for often. I like the combo because without the blazer the skirt would look short and flirty but with the blazer it looks more structured and has a slight edge. Thank you Vanessa! It's my new favorite piece.